IBC Bank-Brownsville joins students for launch of bank's latest Minitropolis® program. BROWNSVILLE, TEXAS (Oct. 19, 2017) - Students at Cowboyville, a small city inside Rosita del Castillo Elementary, celebrated the launch and grand opening of their Minitropolis® program with a ribbon-cutting today. The ceremony included a presentation by Cowboyville Minitropolis® IBC Presidents Noe Rodriguez and Abril Acevedo. The BISD administrators and IBC officers along with the Brownsville Chamber of Commerce conducted the official ribbon cutting. 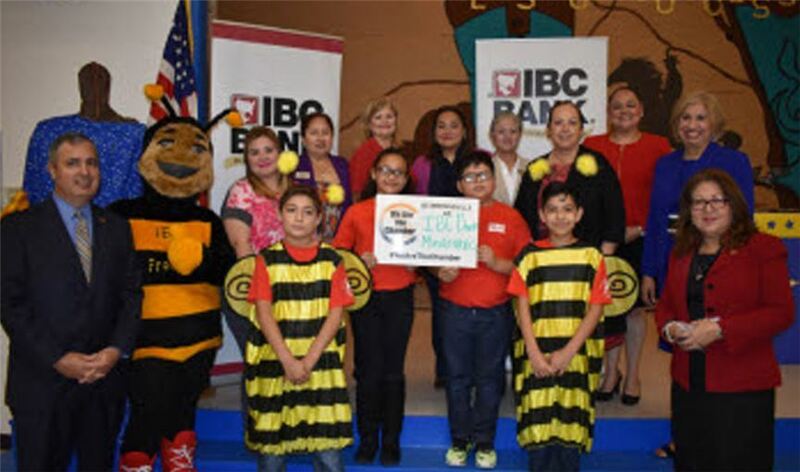 Al Villarreal, IBC Bank-Brownsville President and CEO, and Bertha Garza, IBC Bank-Brownsville first vice president, spoke about the Minitropolis® program's history and its future at Rosita del Castillo Elementary during the event. Brownsville ISD Superintendent Esperanza Zendejas commended the citizens of Cowboyville and their teachers for their dedication to the program. This year the fourth grade class will spearhead operations at Cowboyville before eventually handing the Minitropolis® over to the fifth grade class. In the future, all grade levels will have an active role in Cowboyville starting with the bank, post office and store and working toward the goal of attracting more community businesses to join the program. The Minitropolis® program allows students to see how a community works together for the good of its citizens. Through the program, the children at all grade levels hold a variety of real world positions, depending on their individual interests and passions. The city will start with an IBC Bank, where the citizens earn money for behavior during school, learn how to manage it, and Cowboyville will soon add a news outlet and store. "Financial literacy is essential to our children's education," Villarreal said. "At IBC Bank, we strive for the youngest of citizens to know how their community and their money works. We are confident the investment in Cowboyville will result in a future full of strong, upstanding Brownsville residents." IBC Bank-Brownsville officers, along with the BISD administration and business community, joined Cowboyville citizens to commemorate the occasion. IBC Bank-Brownsville is a member of International Bancshares Corporation (NASDAQ: IBOC), a $12 billion multi-bank financial holding company headquartered in Laredo, Texas, with 192 facilities and more than 297 ATMs serving 87 communities in Texas and Oklahoma. In 2016, IBC celebrated its 50th anniversary since it opened its doors for business in 1966. IBC Bank's slogan "We Do More" reflects the bank's dedication to the growth and success of both the customers and the communities it serves. International Bancshares was ranked 46th on Forbes' prestigious list of 100 Best Banks in America in 2017. IBC Bank-Brownsville has been serving the area since 1984 and has a retail branch network of 12 locations. MEMBER FDIC / INTERNATIONAL BANCSHARES CORPORATION. Visit us on our YouTube channel, IBCBankWeDoMore. More infmation is available at ibc.com.